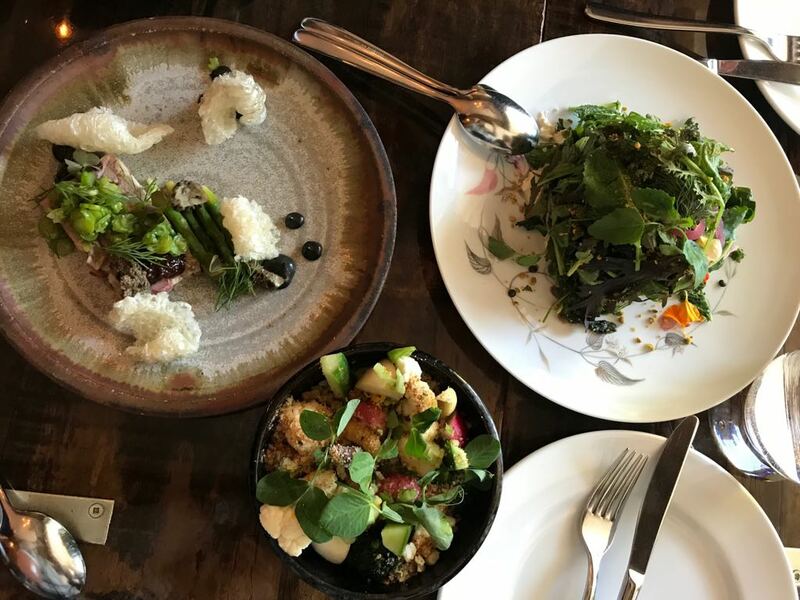 “Our food is exciting, playful, and always thoughtful.” The MacKenzie Room‘s promise of a menu that showcases the best of what BC has to offer, casual, non-pretentious, and creative is what has drawn many praises from foodies and critics since it’s opening 3 years ago. I had the pleasure of celebrating a friend’s birthday dinner with a group of 10 this past weekend at The MacKenzie Room. Since it’s opening, The MacKenzie Room is known for it’s “I Want it All!” tasting menu – available only if you were a group of 4 or more dining at the restaurant. Basically it means you are served everything on the menu. 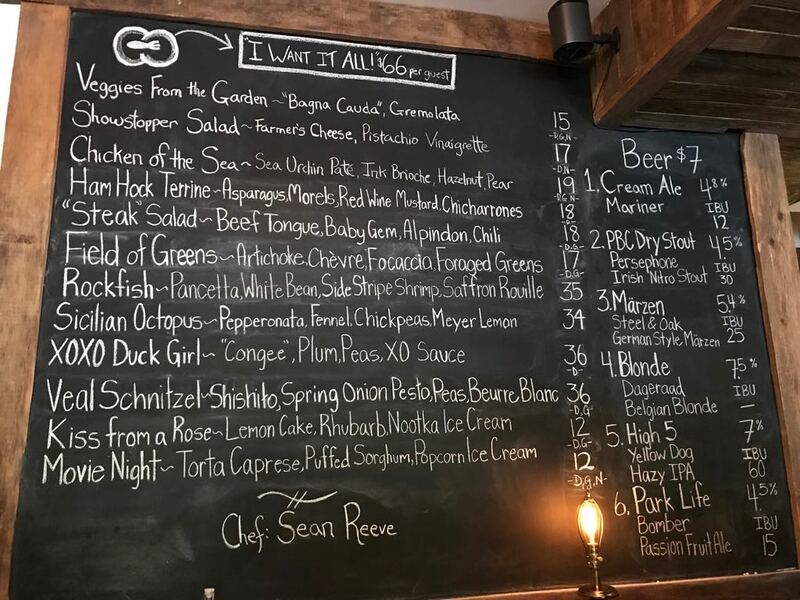 The menu at the restaurant is written on a chalkboard and consists of 12 menu items, changes seasonally, and has a variety of starters, entrees and desserts. Served family style, it allows you and your family or friends to really experience all that The MacKenzie Room has to offer. 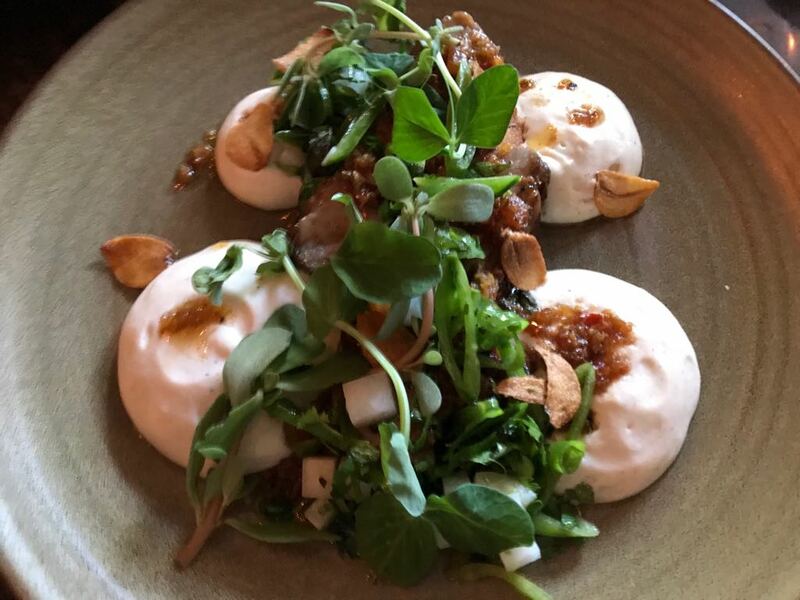 This visit, we screamed “I Want it All!” to try their 6 starters, 4 entrees, and 2 desserts. We first started off with starters, the Showstopper Salad, Veggies from the Garden, and Ham Hock Terrine. The Showstopper Salad consisted of Farmer’s cheese similar to ricotta, local mixed greens, and a pistachio vinaigrette. Veggies from the Garden stood out for me due to its “Bagna Cauda” italian term for hot dip, along with Gremolata (chopped herb condiment). Their Bagna Cauda is similar to a humous, but instead of chickpeas, ground almonds were used instead! I couldn’t stop dipping the locally sourced veggies into the Bagna Cauda. The Ham Hock Terrine was served with asparagus, morels, with a red wine mustard sauce and crunchy freshly fried chicharrones. Next up for the starters was The MacKenzie’s famous and most popular – Chicken of the Sea. It consisted of a sea urchin pate, paired with squid ink brioche, and hazelnut pears. The pate was soft and resembled a nice warm spread, perfect on the crisp and toasted, freshly baked brioche. 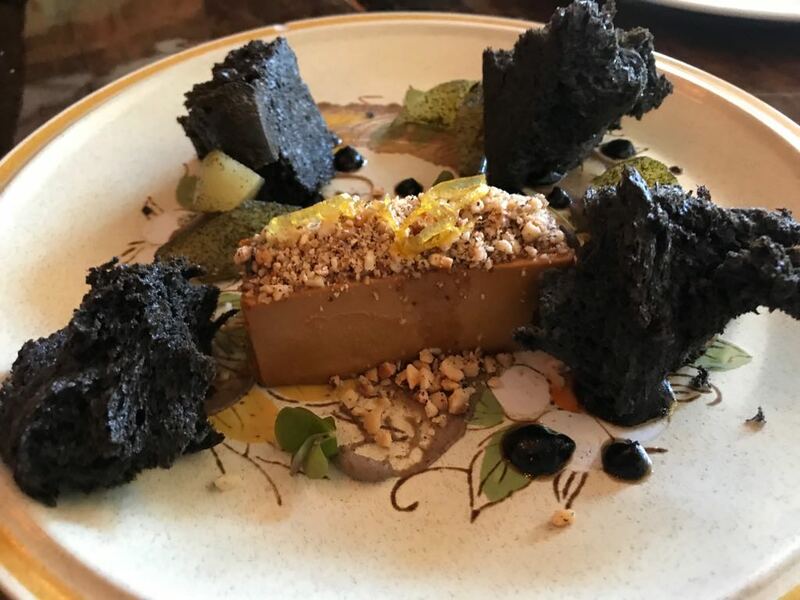 It was rich, melted in your mouth like butter, and decadent – definitely worth sharing should you want to order this as a starter with your date or friends on your visit. 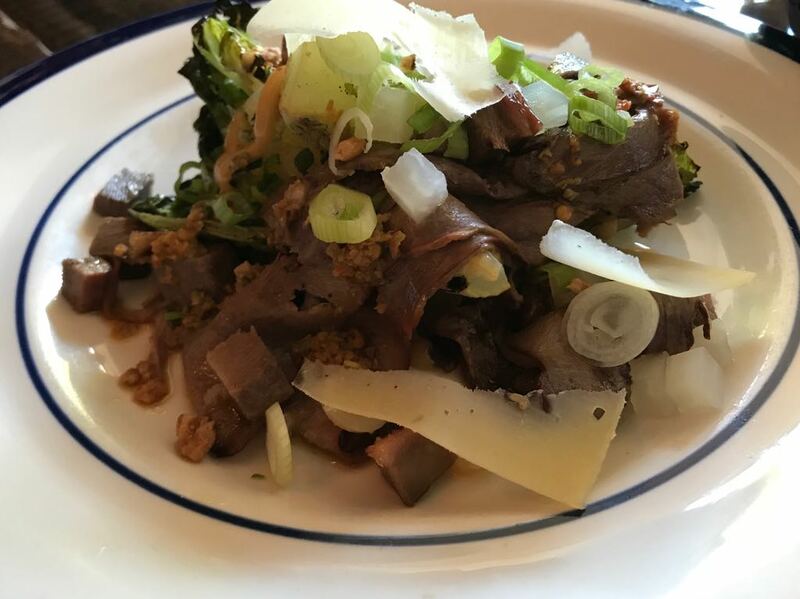 Aside from the Chicken of the Sea, another stellar starter was the “Steak” Salad – beef tongue cooked two ways with a bed of baby gem, alpindon cheese, and chilis. We had slices of beef tongue, as well as small little cubes of it so that there were different textures within the salad. It was flavourful and different than the other salad/vegetable dishes offered. 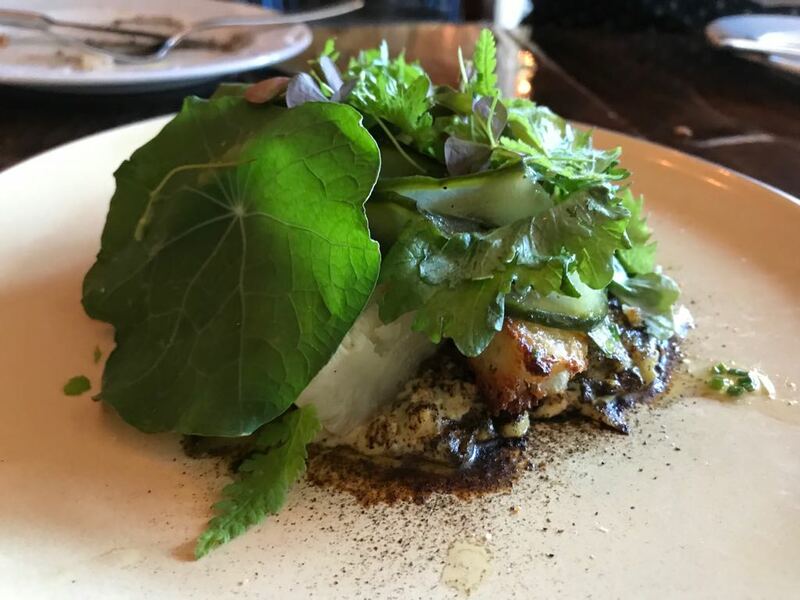 The final starter of the menu was the Field of Greens – a bed of foraged greens, along with artichoke hearts, an artichoke chevre dip, and focaccia cubes. By the time we finished this starter, most of us were already 60-70% full! Definitely a great start to the tasting menu. Luckily they spaced out the entrees from the starters so that we had a bit of a break to rest our stomachs from all the delicious starters. We settled on some delicious cocktails and mocktails. 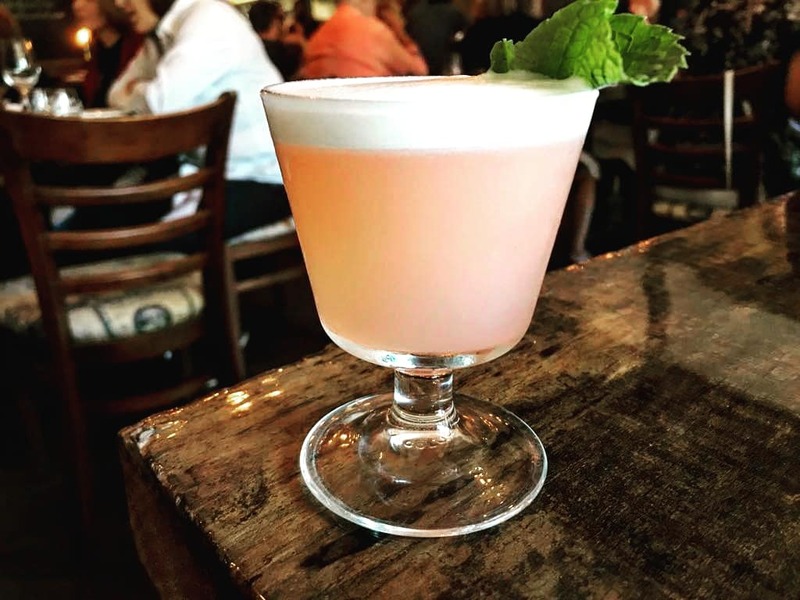 Celebrating the summer, I ordered the Strawberry Fields cocktail – a pisco sour cocktail but with strawberry, lime, and maraschino in it. Light summer cocktail, it complimented the meal and the sunny weather outside! Moving onto the entrees, the first two dishes that came out were the Sicilian Octopus and the Rockfish. 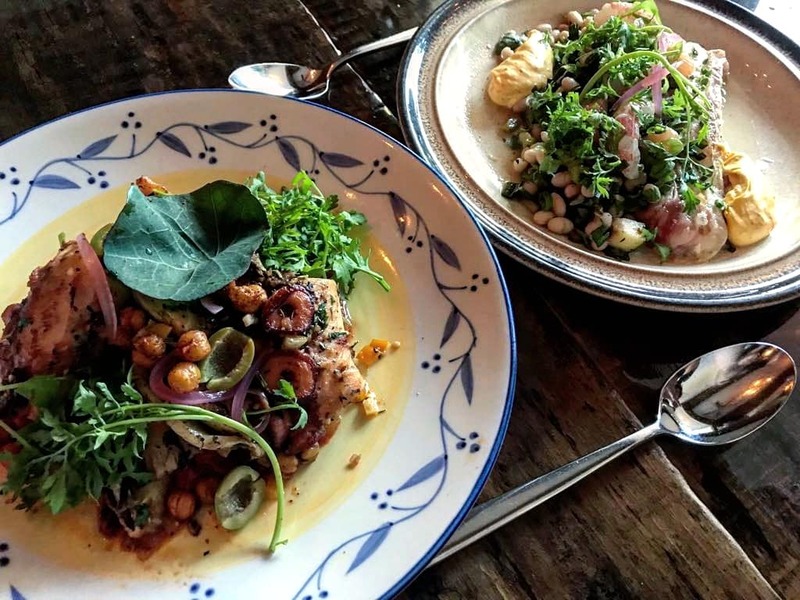 The Sicilian Octopus was soft and tender, with Mediterranean flavours added through the olives, pepperonata, fennel and crispy chickpeas. The Rockfish was sous vide and cooked to a tender perfection, paired with sweet raw side stripe shrimp, pancetta, white bean and a saffron rouille sauce. I really enjoyed how these two came out at the same time. Having the powerful flavours of the Sicilian Octopus with the light and sweet flavours of the Rockfish balanced the palates. The final entree to come out was the Veal Schnitzel – my favourite entreee of the evening! 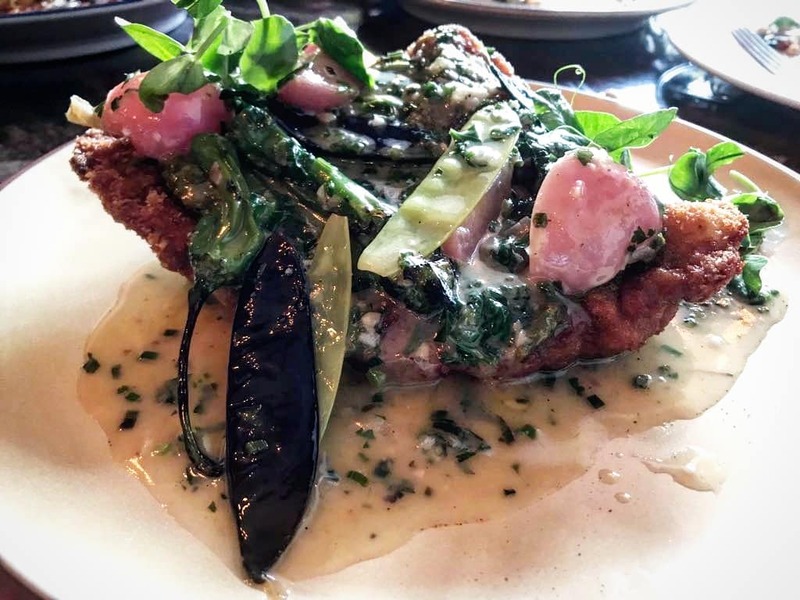 Breaded veal, fried up and topped with shishito peppers, spring onion pesto, and peas in a beurre blanc sauce. Despite it coming out last, with most of the table already 90-95% full, we still managed to polish off the whole dish. Elevated comfort food at its best! Already somewhat full, we all saved what remaining space was left for the two delicious desserts being served up next. For the birthday boy, the server brought out the first dessert with a candle lit so we can all sing Happy Birthday! 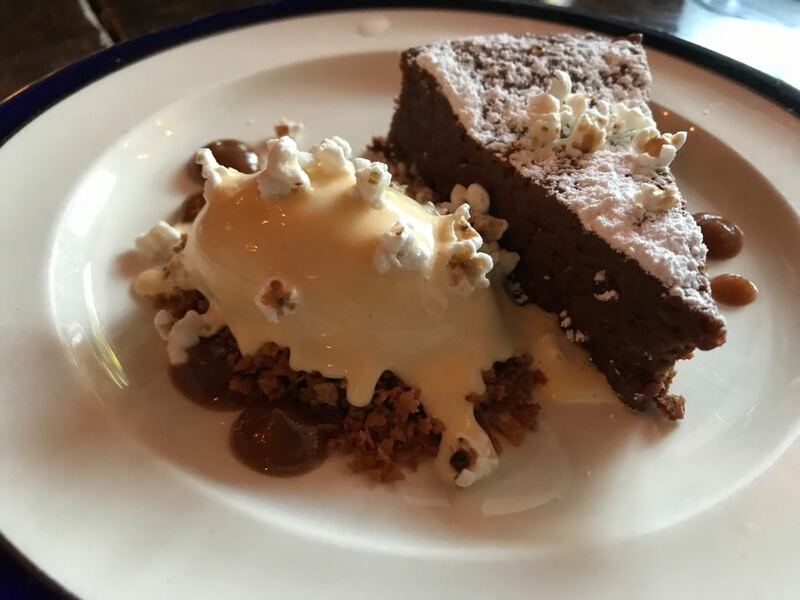 “Movie Night” is a flourless chocolate cake, a torta caprese, topped with puffed sorghum and popcorn ice cream. There were hints of orange rinds/dried orange pieces in the chocolate cake itself. 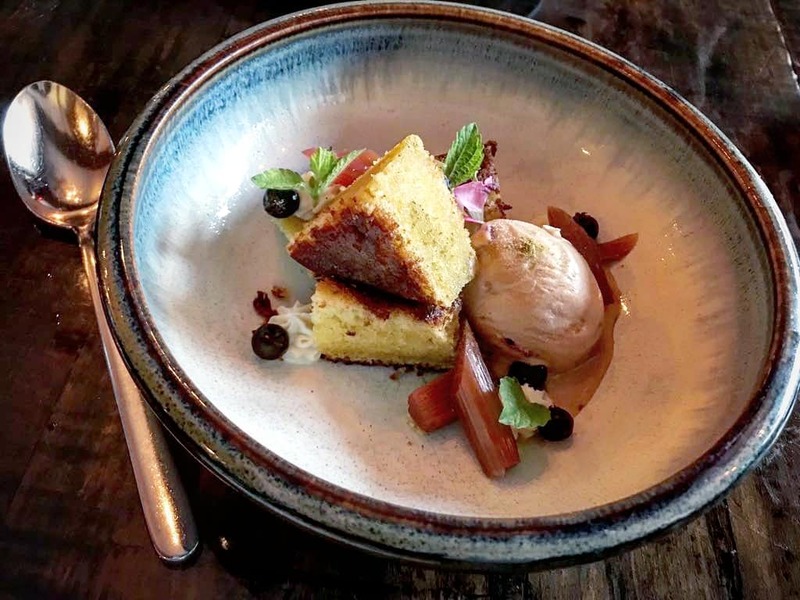 Kiss from a Rose was brought out as the final dessert of the evening – a lemon cake topped with Nootka ice cream and pickled poached rhubarb. The lemon cake was light and fluffy, and the rhubarb was a nice palette cleanser. The MacKenzie Room is located in Railtown, in Downtown Vancouver, at 415 Powell Street. They take reservations and open nightly at 5:30pm. For more info, visit: www.themackenzieroom.com.